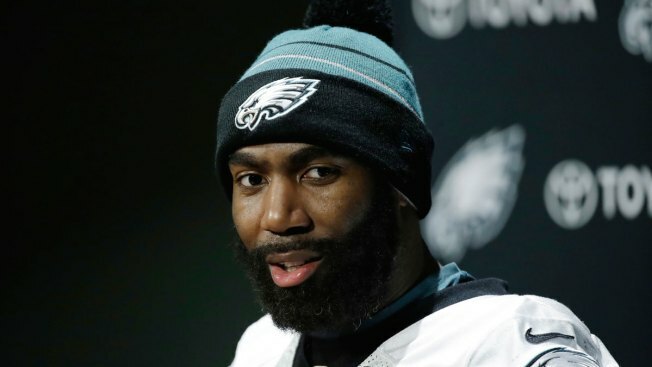 In this Jan. 18, 2018, file photo, Philadelphia Eagles' Malcolm Jenkins speaks during a news conference at the team's NFL football training facility in Philadelphia. Philadelphia Eagles safety Malcolm Jenkins first raised his fist during Week 2 of the 2016 season. It was his version of the protest ignited weeks earlier by 49ers quarterback Colin Kaepernick, who decided to sit and later kneel during the national anthem to protest police brutality and other issues. "At the end of the day, I'm fighting for people," Jenkins told NBC Nightly News’ Lester Holt. "I'm fighting for Americans and citizens that have been disenfranchised, that have been systemically oppressed for centuries." The nine-year NFL veteran has repeatedly emphasized that his and other players' acts of protest were not against the military, the American flag or the national anthem itself - but about starting a productive conversation and working to address social justice issues across the country.